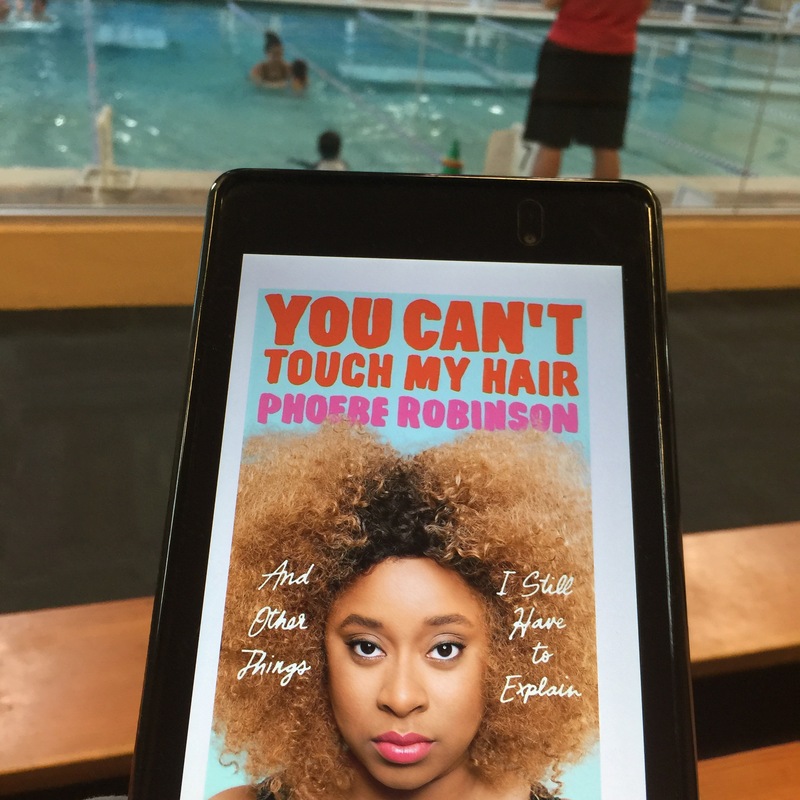 Here’s where I admit I hadn’t heard of Phoebe Robinson before I saw this book..wherever it is that I saw this book..on one of your blogs, on Litsy, Instagram? I definitely saw it very many places before deciding to download it. So who is Phoebe Robinson? She’s a comedian, a host of a podcast called 2 Dope Queens, and a series on YouTube. All of which I hadn’t heard of or seen. I’m obviously not current and modern and young and up to date enough to know all these things! Maybe you are! But you know what, it didn’t matter. It was such a fun, funny read that also made me sit up and learn a great variety of things. In a collection like this there will be essays that make you sit up and go, yessss finally someone wrote this. And there will be others that might not sit so well with you but I kinda reckon that’s still pretty ok as long as Phoebe Robinson is writing it. I mean I could do without all the abbreviations like J/K. That might just be me. But abbreviations aside, she’s just such a delight to read, in her very conversational tone. For instance when she’s ranking the members of U2, or talking about doing her laundry at her parents’ house or ordering for two (for one) from McDonald’s. I mean, she’s even making want to go and investigate her podcasts. Me, who has no time to myself to even finish listening to an audiobook. But she is at her best when she talks about race and racism. She is not one to mince her words or to call out people for their racist behaviour. My favourite chapter is where she writes letters to her 2.5-year-old niece Olivia, who is biracial. Now that is an awesome aunt. This was just such a delight to read. First things first. If you haven’t watched the Gilmore Girls reboot – and especially if you’ve never seen Gilmore Girls at all – you really should just go carve out a good chunk of your time and go watch them all. Right now. Pop some popcorn, make lots of coffee, get in your pjs and settle down with Netflix. There are seven seasons and 4 90-minute episodes! An attempt at bookface for Litsy the other day only to realize later that my hair is horrendous! I wasn’t at all disappointed with this book though. I mean sure you can’t go into it expecting writing that blows you away. But if you’re a GG fan then I think you would be happy with it. 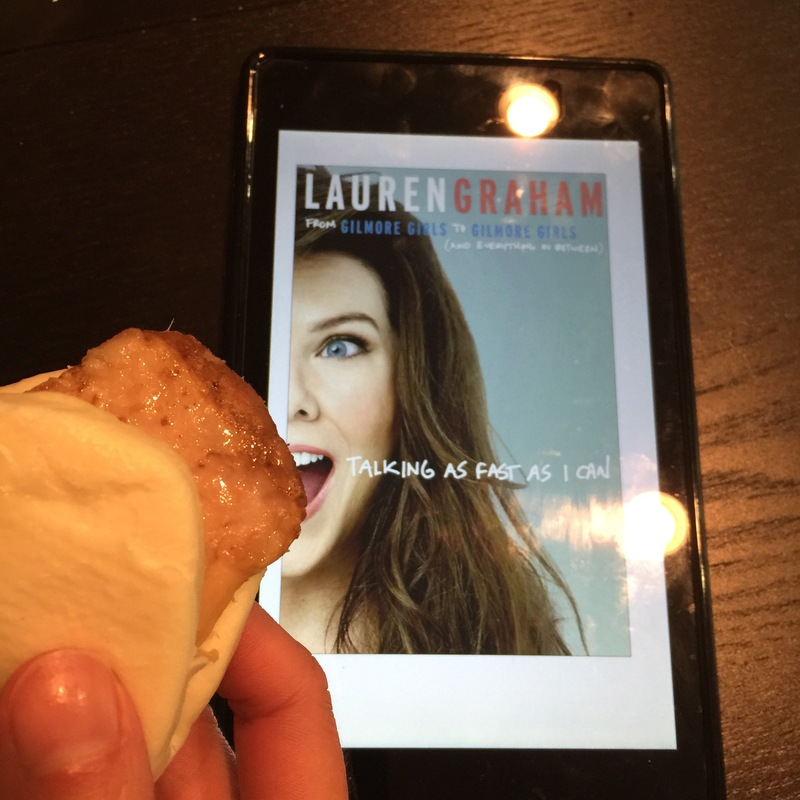 Lauren Graham writes in a friendly conversational way. Like you were sitting at Luke’s and eating burgers and fries and she was right opposite you, telling you all this. And pancakes and coffee. And tacos and coffee. It would be a really loonnng conversation. Part of me wishes I listened to this as an audiobook but neither of the libraries I’m a member of had it in their Overdrive so eh. But I guess I could always sign up for Audible or something. But back to the book. The best part of it is of course when Graham talks about the show she is most famous for. But she also talks about her childhood (she lived in Japan! Her mom was so glamorous! ), she walks us through what it was like for her starting out as an actor and more. 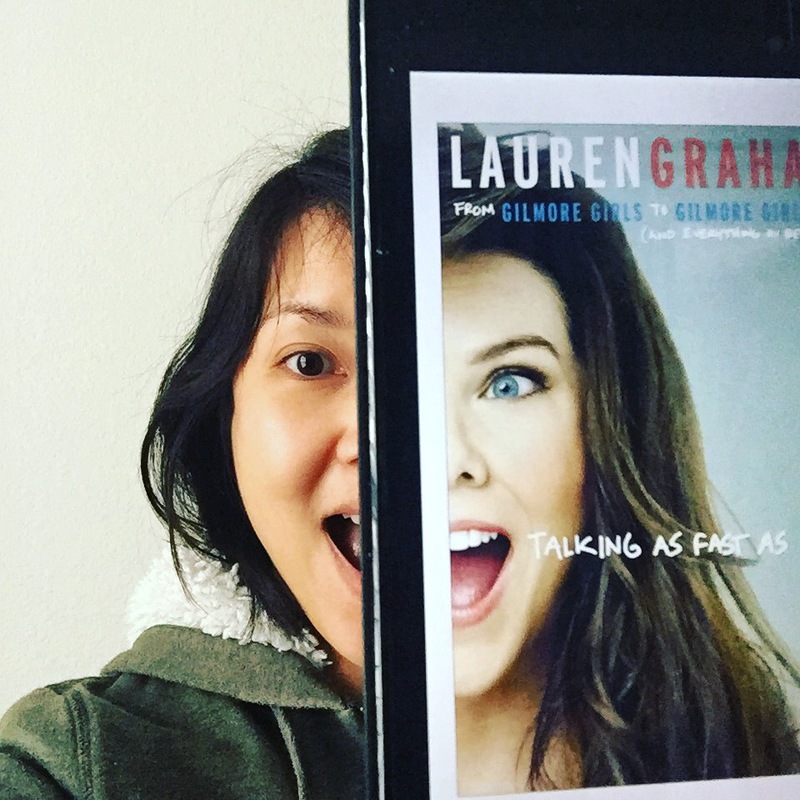 Interesting enough, but you know it’s kind of filler for what this book is really marketed to be – the book for the Gilmore Girls fan, published not long after the reboot appeared. And it was a fun light-hearted read. It made me smile and gave me the warm fuzzies sometimes, as she reminisced about the show. You don’t go into a book like this expecting anything profound or insightful. It was a quick fun read and I just adored it for what it is, and pretty much what you expect from the subtitle From Gilmore Girls to Gilmore Girls, and Everything in Between. Immigration and citizenship has been on my mind of late. I read a lot of fiction about the immigration experience (like Americanah, The Namesake, The Book of Unknown Americans), but not much in terms of nonfiction. These are some of the books I have read that fit into this category. The Cosmopolites: The Coming of the Global Citizen by Atossa Araxia Abrahamian was a short read about ‘citizens of the world’ including the buying and selling of passports, and the Bidoon, who are the stateless people of countries like the United Arab Emirates. I read The Devil’s Highway: A True Story by Luis Alberto Urrea a while ago (it was published in 2004) but I still remember the horror of reading this book about this group of men who attempt to cross from Mexico into Arizona. The Snakehead: An Epic Tale of the Chinatown Underworld and the American Dream by Patrick Radden Keefe was a fascinating tale about a $40 million smuggling business run by a middle-aged woman known as Sister Ping. I always love when bloggers and book sites do this, but when I sat down and thought about it, I realize that this isn’t an easy task. Maybe it’s because I don’t read much nonfiction? But here are some attempts! Seveneves is one of those the Earth is doomed kind of books but with women in the key roles. Hooray! That made me think of the Rocket Girls, women who worked at Jet Propulsion Labs (JPL) as “computers”. That was the term used for their jobs in the 1940s and 1950s – they did calculations (velocities, trajectories) and all the math behind getting these rockets into space. And it was pretty much an all-women team of human computers. I recently read Wangs and loved this smart and funny book about a family whose fortunes have fallen. I thought a good nonfiction pairing would be one about Chinese immigration to America as well as one that talks about the 2008 financial crisis. I haven’t read The Big Short yet but want to after reading the Wangs. Another two-fer. I picked Orphan-Master’s Son as that’s the only popular fiction I’ve read set in North Korea (if you’re interested, Hwang Sok-Yong’s The Guest is set in North Korea, but I’m guessing he’s not a familiar name to many). Barbara Demick has written an unforgettable book about life in North Korea and Yeonmi Park relates her own experiences growing up in North Korea in her book. try: As You Like It: Inconceivable Tales from the Making of the Princess Bride by Cary Elwes. If you can get hold of the audiobook, even better! I read more nonfiction than I thought I did – 24 books! And a good number of them were audiobooks, which is very unusual for me. It’s hard to pick just one! I loved listening to As you wish: Inconceivable Tales from the Making of the Princess Bride that was just an absolute treat for the ears! Bluets by Maggie Nelson was, at 113 pages, so short but so beautiful. And The Song Poet. The Song Poet by Kao Kalia Yang, a Hmong American writer, is a book that more people should read. First of all, the story of her father and his family struggling to survive, having to flee their village is moving, emotional. Their stay in a refugee camp in Thailand, where Yang was born, was painful. But it was even harder to read about their life in America, where they work day and night to make a new life for their family in this strange new land.